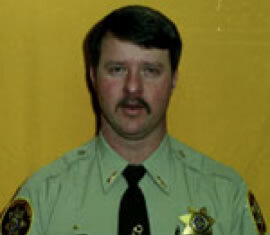 Deputy Wright died in a large wildfire in the mountains above Midway. The 38-year-old victim and civilian county employee Ralph M. Broadhead, 64, were constructing a firebreak with a bulldozer when the fire overwhelmed them. After radio contact was lost, searchers found their bodies near the bulldozer. Deputy Wright was married and the father of six children. He is buried in Heber City Cemetery. His bronze memorial plaque is sponsored by Wasatch County Sheriff’s Office employees, Frank Ostman, and the Blake Wright Family. Blake was a good friend to me and my family. I was working security for the sheriffs office when I heard the head USFS fire officer on that fire asking the planes that were reckoning the fire where that CAT was. I am friends with Brent, that fire head and I could tell he knew something was wrong. The aircraft just kept giving updates about how close the fire was to all those damned empty cabins. Brent was almost begging them to find that CAT. After several hours, we know it wasn’t to be good news. I’m going over in my writing here, what transpired from my point of view. Blake used to stop at the guard station everytime he had a forest run, as the sheriffs office calls them. One day, when he came by, we were just trying to take care of my oldest son, after he had fallen from a top bunk. He looked at him and would not leave until my wife and children were hesddd to Heber hospital emergency room. It was his nature to care for his fellow man. I was riding as a reserve one night on New Years Eve and he positioned our vehicle on the north end of Heber Main Street and when his watch said the new year had arrived. It was lights and sirens down the road. I wasn’t at this event, but was told that there was a chase coming down Daniels Canyon head at high speed towards Heber, where there was a lot of unsuspecting traffic. Blake, I’m told went up the canyon and waited, his patrol vehicle pointing down canyon, for this creep to come into view, then pulled out in front of the suspect and gained speed to almost match the other car, then started to slow, to slow the advancing vehicle. The other driver didn’t seem to want to slow down, so instead of letting this vehicle out of the canyon where he the criminal would be endangering the general Heber Valley population, he slammed on his breaks and the “@$;@/d slammed into Blakes patrol vehicle pushing it off the road. The fleeing felon was stopped and some wondered how Blake had survived it. A big box in the back of that vehicle broke lose from the back floor where it was bolted down, came lose and flew into the front seat with Blake. Some think he gave his life that first day, they are wrong. He was giving his life to his family and community everyday he opened his eyes. I have missed him in my life often. He was always cheerful, fulll of life and giving and sharing. I always felt the State Parks should have put up a memorial in his Honor at that site, but I was shown a small plaque put up for those to gentlemen at the Visitor Center at the Wasatch Mountain Golf Course. Of course it’s gone now. I tried, when they built the bre court house jail facility, to name it in honor of Blake. I guess I’m not political enough to understand why this man, who daily gave his all couldn’t be remembered there. I guess the sheriff and the politicians have their reasons. At least he is awknowledge and remembered here. I won’t be to long before we meet again, my friend. I hope I’ve been good enough to be near where you are.